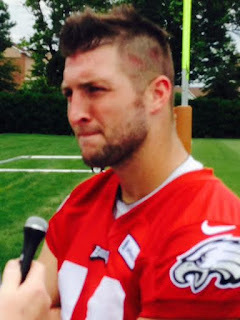 The Phanatic Magazine: Is Tebow really in play for the Eagles? PHILADELPHIA — There are a host of now ex-Eagles who can confirm Chip Kelly doesn't like players who speak out of turn. "I look at it from the Navy SEALs' point of view: 'I do not advertise the nature of my work, nor do I seek recognition for my actions,' " Kelly told Philadelphia-area reporters earlier this summer when describing his insular personality and coaching style. When now-Seahawks cornerback Cary Williams expressed displeasure on how hard Kelly's up-tempo practice regimen can be on the players, it wasn't a matter of if the veteran cornerback was leaving Philadelphia, it was a matter of when. And when so-called "big" personalities like DeSean Jackson and LeSean McCoy went off script, they felt the wrath of Kelly, resulting in their new addresses. If you want to be in Philadelphia these days you must buy in to Kelly's vision and part of that is letting those deputized to talk handle the heavy lifting when it comes to the media. After any open Eagles practice you will see team leaders like center Jason Kelce and linebackers Connor Barwin and DeMeco Ryans holding court as extensions of what Kelly wants released to the public. Brandon Graham isn't one of those trusted mouthpieces but he is Philadelphia's best pure outside pass rusher and an emerging playmaker who got a big-money, four-year extension in the offseason, one that was at least partially fueled by the interest of the NFC East rival Giants. Graham didn't say anything disparaging about his organization or Kelly so his future employment isn't at risk but he did offer up some information the coach probably wanted kept under wraps on the possible impact of polarizing quarterback Tim Tebow, the perceived fourth-stringer when the Birds open training camp on Sunday. In most NFL cities Occam's razor would be applied here (the simplest answer is usually the correct one). And what does a hybrid outside linebacker/defensive end know about the inner workings of Kelly's quarterback plans anyway? It's conceivable Graham just likes Tebow personally or perhaps the former first-round pick is just a poor talent evaluator who can't see the mechanical issues that were still on display during offseason work, most notably Tebow's elongated throwing motion and sometimes laughable footwork. But, this is no longer the B.C. age of the NFL (Before Chip) and if any coach has a plan for the former Florida Heisman Trophy winner it's going to be the guy who believes his football program should be run like the Navy SEALs. Tebow's skill set of speed and strength could be maximized in Philadelphia where Kelly's offense is a simplistic one based on the read-option and tempo. There is no asking the quarterback to make Peyton Manning-like progressions from receiver to receiver. It's one-read and go, and that first outlet is picked by the sideline not the signal caller. In theory that scales down the decision-making and makes anticipatory throws, something Tebow struggles mightily with, off the table in what some have called a quarterback-proof offense. Furthermore, it's not all that far-fetched to speculate that Sam Bradford might tear his ACL getting out of his car at the NovaCare Complex Sunday and you know that four-interception game from Mark Sanchez is right around the corner. So, only Kelly punching-bag Matt Barkley stands between Tebow and the roster spot which could spur opportunity. Most have speculated that chance would only be as a red-zone threat or a two-point specialist but the only certainty about the Eagles quarterback position is the uncertainty. So maybe Brandon Graham knows a little more than we think and you can bet Chip will have a little talk with him about that.